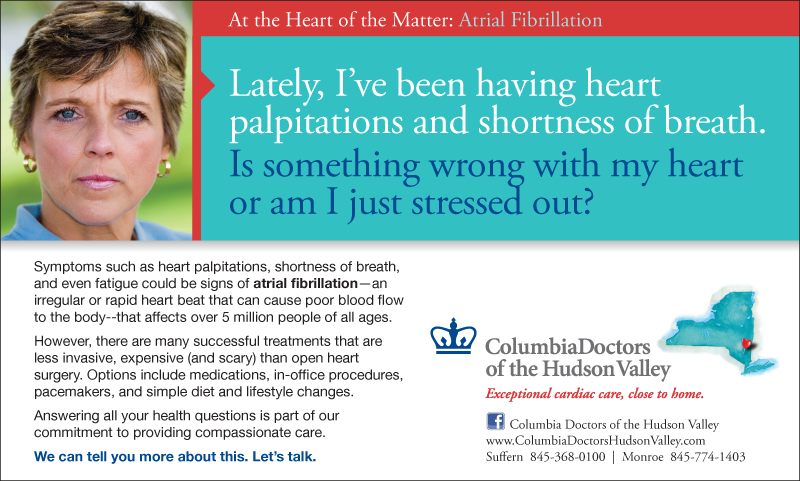 One of the cardiologists at ColumbiaDoctors of the Hudson Valley wanted an advertising campaign that would alert people to the seemingly benign symptoms of heart-related diseases that could have serious implications if not treated promptly and properly. And while he wanted to motivate people to take action, he didn’t necessarily want to scare them. In addition, he wanted two separate campaigns—one that focused on the those age 65+ and another on the “working well” ages 35-65—as symptoms and treatments varied for the two age groups. To date, the ads have appeared in the Journal News in Westchester, Rockland and Putnam Counties, on billboards at the Palisades Center Mall, and online on yahoo.com and LoHud.com.